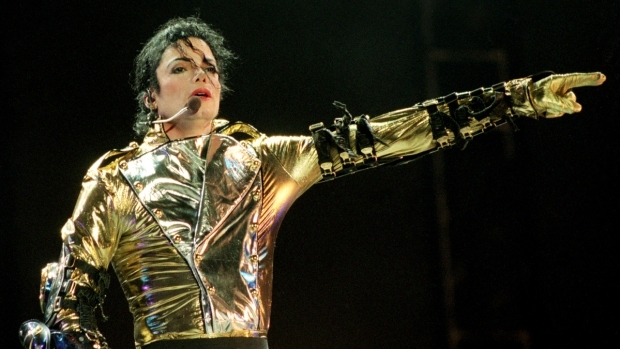 Michael Jackson's estate landed this biggest recording deal in history. The biggest record deal in history is going to a dead guy. Michael Jackson’s estate inked a guaranteed $200 million contract with Sony Music Entertainment for 10 projects over seven years, The Associated Press reported late Monday. The record-breaking contract could be worth up to $250 million if certain conditions are met, a person familiar with the deal told the AP. One of the albums will be of never-before-released Jackson recordings that will come out in November, the person said. An official announcement of the deal is expected later today. Future projects may also include a video game, a DVD compilation of videos and a re-release of "Off the Wall," the King of Pop's fifth studio album, which first came out in 1979, accompanied by some unreleased material. Before his sudden death nine months ago at age 50, the pop star had wanted to re-issue the album, people familiar with the deal said. The new financial windfall comes even as circumstances around his death remain in legal limbo. Dr. Conrad Murray faces an involuntary manslaughter charge for allegedly giving Jackson a lethal combination of sedatives. He is due back in a Los Angeles court April 5. One of the projects already counted in the new contract was the two-disc album that accompanied "This Is It," the film based on footage of concert rehearsals for what was to have been Jackson's comeback at London's O2 arena. Including the more than 5 million copies of that special release, Jackson has sold some 31 million albums since his death in June, about two-thirds of them outside the United States. "During his life, Michael's contracts set the standard for the industry," said John Branca, the co-administrator of the Jackson estate, in a statement prepared for release Tuesday. "By all objective criteria, this agreement with Sony Music demonstrates the lasting power of Michael's music by exceeding all previous industry benchmarks." Rob Stringer, chairman of Sony Music's Columbia Epic Label Group, said in prepared remarks, "We're dedicated to protecting this icon's legacy and we're thrilled that we can continue to bring his music to the world for the foreseeable future." The landmark deal tops all other benchmarks, including the all-encompassing rights deals that concert promoter and ticket-seller Live Nation Entertainment Inc. had previously signed with Madonna at $120 million and Jay-Z for $150 million. The deal with Jackson's estate is even more remarkable because it does not include royalties from merchandise. The contract shows the value of legacy artists. It also comes at a time of decline for the music industry, with sales down about half from their peak in 2000 mainly due to free file-swapping. The money will go a long way to settling Jackson's debts, estimated at around $400 million at the time of his death, according to the AP. The "Thriller" singer whose life was plagued with scandal has had a resurgence in popularity in death. Revenue from "This Is It", song sales and merchandising agreements brought into the estate revenues of about $100 million, lawyers for the estate's administrators told a Los Angeles Superior Court judge in December, when they sought a percentage as an administration fee. Jackson's most lasting and valuable asset is the 50 percent stake in Sony/ATV Music Publishing, a company that owns publishing rights to music by The Beatles and numerous other artists, including Elvis Presley and Bob Dylan. The copyright catalog itself is estimated to be worth $2 billion.